The Village of Menomonee Falls is located northwest of downtown Milwaukee and in the northeastern corner of Waukesha County. “The Falls,” as residents refer to their Village, takes pride in not only its status as being the largest Village in Wisconsin, but in its independence and in its ability to successfully maintain a quiet character and high quality of life during a lengthy period of growth and development. 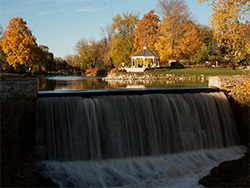 Menomonee Falls takes its name from the Menomonee River, which courses diagonally through the northeast corner of the Village. It was along the banks of the river that early settlement of the Village took place. Today, Menomonee Falls boasts open and natural preserves–the perfect setting for contemporary residential development. Easy access to expressways is drawing more and more families to The Falls. New homes in new subdivisions continue to spring up along the many roadways that crisscross the Village. Menomonee Falls is a self-contained and self-sustained community. While proximity to Milwaukee is an advantage, The Falls has developed and retained its own unique character and high quality of life. Its setting is enhanced by lush parks, wildlife areas, beautiful homes, excellent schools,fine churches, quality healthcare, superb recreational resources, and prosperous industrial and business facilities. Schools and Village government have achieved a high degree of efficiency, effectiveness, and excellence. The community is within close proximity to several quality technical colleges and many respected colleges and universities. Roadways linking The Falls with surrounding metropolitan, suburban, and rural areas allow residents abundant choices of shopping, cultural, entertainment, recreational, and professional sports activities. Menomonee Falls’ independent spirit prevails. With vision and skilled management, the Village continuously moves forward with confidence in its people and its ability to preserve an enviable way of life. From large plazas to unique downtown shops, it’s all here for your purchasing pleasure.